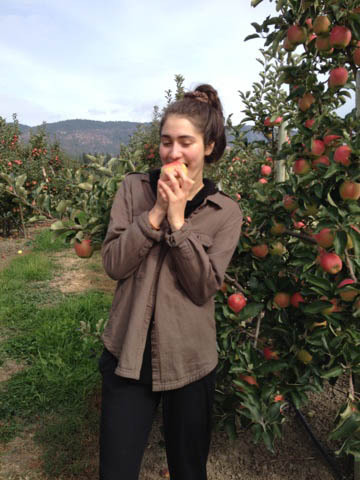 Eating Ambrosia apples offers many health benefits but as we head into the fall, perhaps the most important reason to eat more apples is to support your immune system. The body’s immune system is what helps us fight off illnesses. When it’s working well, it can attack most invading viruses and bacteria to keep us feeling healthy. If a bug does manage to take hold, having a healthy immune system may help us recover from that cold or flu faster. So, how do you maintain a healthy immune system? The answer is long and complicated but one of the key elements is eating a healthy, nutrient-rich diet. Ambrosia apples are part of a healthy diet but they also have specific properties that help to boost the immune system. For example, Ambrosia contain Quercetin. This flavanoid, like other antioxidants, supports immune efficiency by fighting off free-radicals. Studies have also found that Quecetin helps decrease inflammation in the body and minimizes other health issues, which could otherwise tax the immune system. Ambrosia apples are also a good source of soluble fibre. Studies point to soluble fibre as a good way to strengthen the immune system. Soluble fibre also benefits digestion and has anti-inflammatory properties. These additional benefits decrease demands on the immune system allowing the system to focus on defending against viruses and bacteria. Vitamin C is well known as a way to ward off colds and the flu. That’s because it facilitates the body in creating antibodies and white blood cells that aid in shielding against pathogens. Vitamin C’s antioxidant properties also help to strengthen cells and fight off disease. Ambrosia apples are a good source of vitamin C with approximately 9 mg in a small apple. The final immune system benefit from eating Ambrosia apples has to do with the bigger health picture. We mentioned earlier that a big part of maintaining a strong immune system is a healthy diet but that’s only part of it. The immune system functions best when the body itself is functioning optimally – when we sleep well, aren’t stressed out, have good digestion and are generally physically fit. That’s a tall order, but eating Ambrosia apples regularly can actually help with all of these health goals too! So, grab your daily Ambrosia apple and take a bite out of the cold and flu season .